There’s nothing better than a chewy golden cookie cup filled with peanut butter and chocolate! 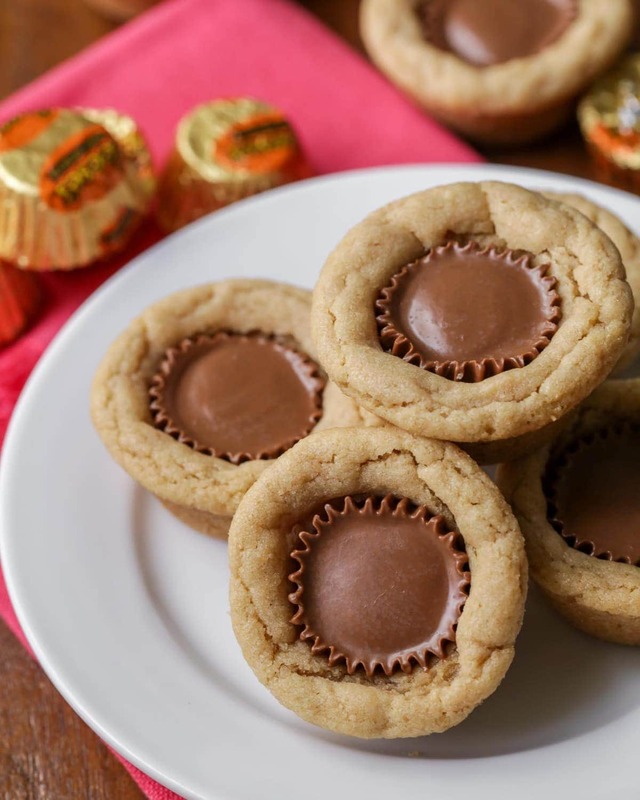 Our family LOVES these Reese’s Peanut Butter Cup Cookies! They’re so simple to make, and SO yummy! Hi – Lily here! Sometimes I write about desserts that we made a long time ago, and this recipe for Peanut Butter Cup Cookies is one of them. We made these at the beginning of the year. They were so delicious and my mom said she’s been making them since she was little! We love Reese’s (hence the reason we have recipes for homemade Reese’s and Reese’s Fudge), so these Peanut Butter Cup Cookies were a HIT! The cookie part tastes sooo good, and they turned out nice and chewy. My favorite part of making these cookies was putting the Reese’s Peanut Butter Cup in the middle once they came out of the oven. 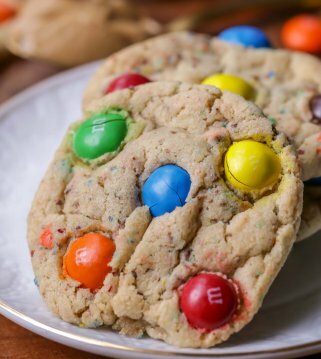 I bet your kids would have fun making these cookies with you too! 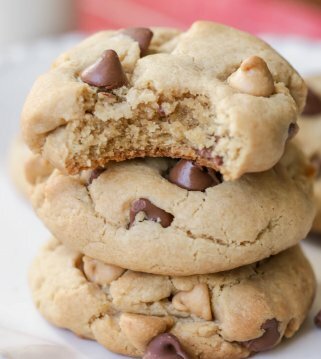 If you like Reese’s and cookies, then you’ll love this recipe. These are so easy to make! All you have to do is combine the ingredients (besides the Reese’s) in a mixer. Mix on SLOW until everything is well combined. 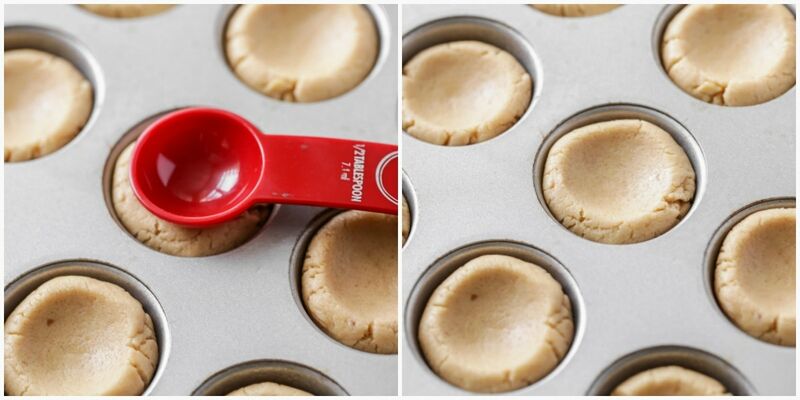 Form the cookie dough into 1 – 1 1/2 inch balls and put them in a greased mini muffin tin. Use the back of a spoon to make a little indent in the top (this will help the cookies bake perfectly to add the candy.) Bake for 8-10 minutes at 350°. Once they come out of the oven, put an unwrapped peanut butter cup in the middle of each cookie and press lightly. Let the cookie cups cool before removing from pan. ENJOY! 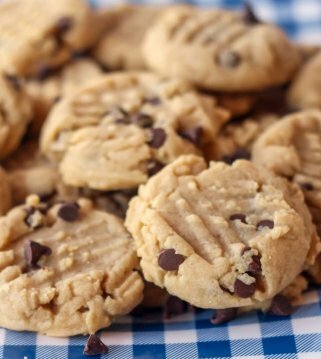 Can you use Crunchy Peanut Butter for cookie cups? Of course, you can! 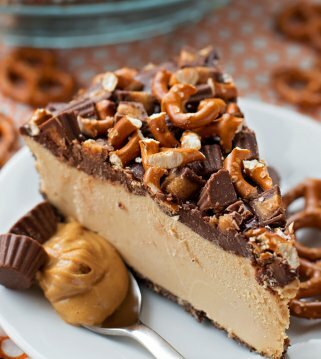 Not all the kids in our family love nuts, so we typically stay with creamy peanut butter. Having said that, crunchy peanut butter works well too. You can even change out the Reese’s to be whatever variety you like post. The white chocolate Reese’s are delicious too! 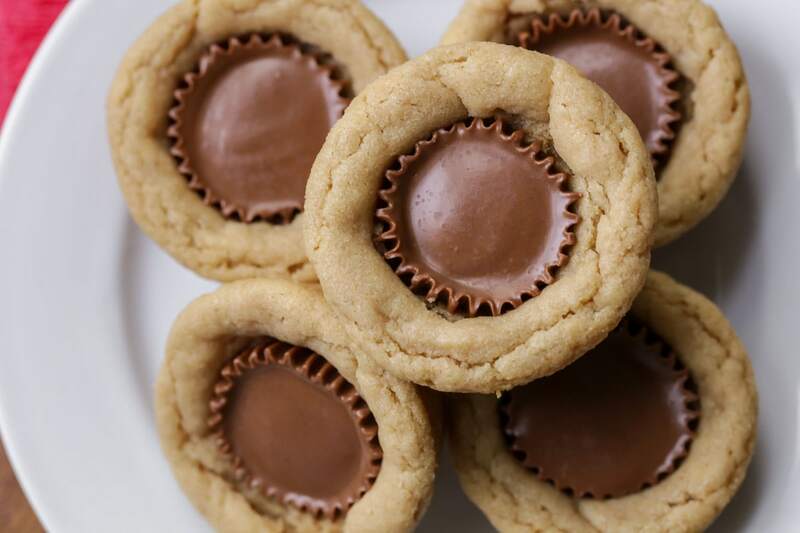 How to store peanut butter cup cookies? Place in a Ziploc bag and seal and place on the counter for 3-4 days. If you want to enjoy these warm, we recommend placing them in the microwave for 8-10 seconds. Can you freeze the peanut butter dough? Yes, you can! Place in a Ziploc bag and then place in an air-tight container and put in the freezer for up to 3 months. Let thaw in fridge overnight before placing in muffin tins to bake. There's nothing better than a chewy golden cookie cup filled with peanut butter and chocolate! 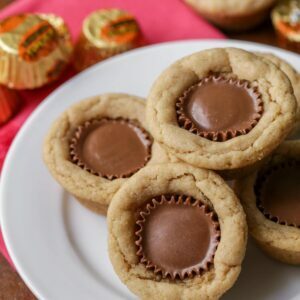 Our family LOVES these Reese's Peanut Butter Cup Cookies! They're so simple to make, and SO yummy! Combine all ingredients in kitchen aid (minus the Reese's) on SLOW until well combined. 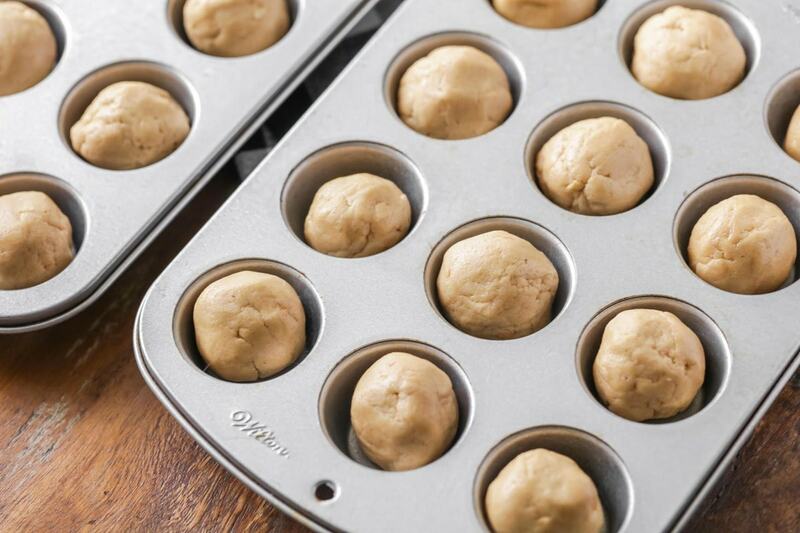 Form dough into 1 - 1½ inch balls and place in greased mini muffin tin. Bake for 8-10 minutes. Once removed from oven, put an unwrapped peanut butter cup in the middle of each cookie and press lightly. Let cool before removing from pan. ENJOY! Hi, I just made these today. They were really crumbly when I tried taking them out of the pans. I let them cool in the pans, but I think they needed to stay in the pans a lot longer than what I had done. The ones I left in the pans the longest did come out better, but still kind of crumbly. Maybe chilling them in the pans next time would work better. Peanut butter cups are my favorite!! I was so excited to try these & let me say, they are my favorite!!! They are so soft & pretty easy to make. 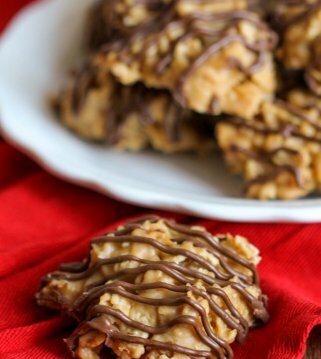 I will be adding these to my goodie plates this Christmas! Love anything reeses! And THEse cookies are no exception. 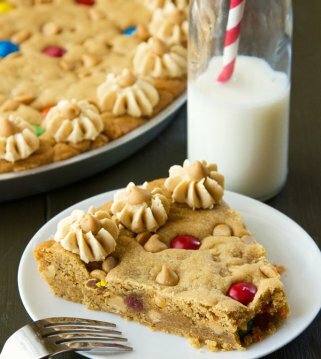 They are a fun alternative to peanut butter cookies. So good!